The Video Camera Detector is used to find hidden cameras that may be operating or dormant, in your home, office, hotel room ; And this Video Camera Detector is a compact, lightweight, battery operated optical device that enables the detection & location of pinhole size surveillance cameras. 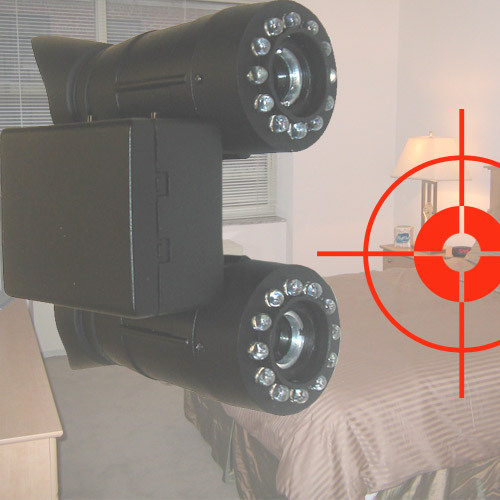 Using a low-power light to search a room or area, the Video Camera Detector can help you figure out if you are being watched by video surveillance devices that might be invisible to the eye. Most video camera detectors use one optical verification scope to identify video surveillance cameras, but our Video Camera Detector offers two optical verification scopes that converge to rule out false detection patterns when searching for suspicious video cameras. Searching is conducted by emitting a visible beam of light in a 15 degree angle. As the light strikes the surface of any optical lens that is connected to a video imaging device, such as a pinhole camera, a green spot will be visible on the optical viewfinder of the Video Camera Detector. Note: The Video Camera Detector is custom built. Check availability for delivery details. Q: Is the Video Camera Detector easy to use? A: Yes, it generally is easy to use indoors. Outdoors may be difficult, and sun glare can make it even more difficult for video camera detection areas under examination. Q: How effective is the Video Camera Detector at finding hidden pinhole cameras? A: After you practice using the system in a given area, you begin to figure out what is a potential camera threat and what is not. Its realy a powerful tool that eases your mind when you are looking for a security camera that you cannot find but know its there. Here at www.spyzone.com, we recommend practicing with the Video Camera Detector before sweeping the suspected area for concealed cameras. Our Video Camera Detector is designed for best possible performance in an area of 2 - 15 meters (6 – 45 feet) and is intended to be used indoors. The Camera Detector can be used outdoors, and at greater distances, yet the performance level may decrease. Common detection capabilities include the location of hidden cameras inside a building, room, or office. Although the Video Camera Detector uses low level illumination to disperse light, you should not aim the system at reflective surfaces (mirrors) close up. The system is also disguised as a binocular with rubber eye-flaps. The objective lens is connected to the battery housing, where the control circuit and activation button for mode selection is located. The Video Camera Detector takes a while to build. All optics are custom cut to specification. Order delivery can range from 2 - 4 weeks.